I am having an outbreak of cyano right now. Should I remove the cyano or let it keep growing? 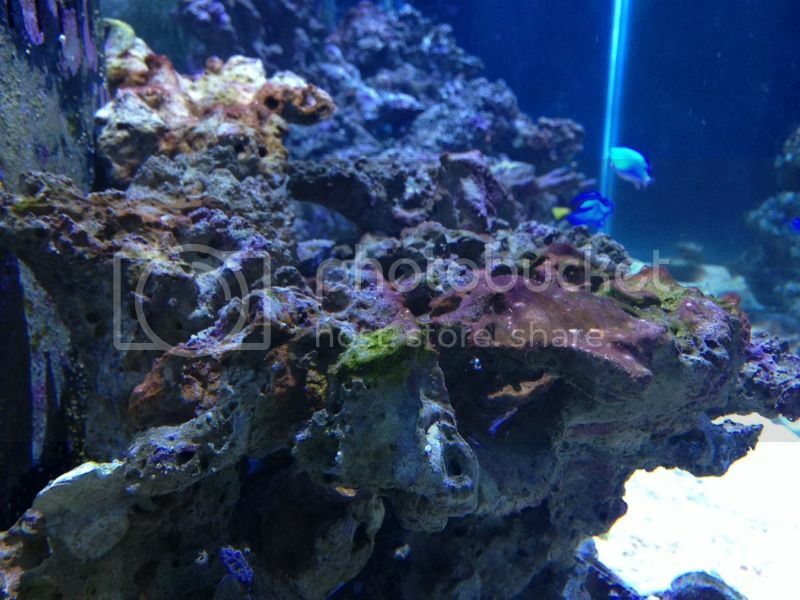 Not sure on how the cyano affects corals and dinos? Any suggestions? My shipment came in today. I'm dosing tonight!!!! I'm still "lights off". I started Friday night, I turned off all lights, I dosed according to instructions. I turned off carbon and turned up the skimmer. It says to dose every 2 days so tonight I'm dosing again and the lights will be back on Monday. I hope it works. I don't have a severe case, only on the rocks and water-line. I'm thinking of using the turkey baster tonight with lighting from my cellphone to add killing it all. Siphoning out cyanobacteria should be useful, unless any fresh water added to replace what's removed adds enough trace elements to be an issue. I'd give it a shot, personally, but I would spend only a few minutes a week, or maybe a day, for a while, to see how it affects the system. I bought it from BRS. I bought the 500ml and it's still in stock. The 250ml was there last week but now is sold out. I snagged the 500ml because I don't know how long I'll be dosing and I remember a time when it was out of stock everywhere. Removing sandbed next week if dinos dont get any better. I feel like they love the sand. but why? Any relationship the sand that they love? Running BB for 3.5 years and believe me it's the same with or without sand. It's just they can cling to sand which is more difficult than clinging to bare glass. As soon as I have just a spec of detritus on the bottom, they cling to that so really no reason to throw your sand away. That will in 99% of cases not solve your problem (speaking from personal experience). What if.... I siphon top layer of sand out and let soak in RO for a few hours. Then wash in fresh RO again to remove toxins, then add back to tank? This should remove a lot of the dinos right? For the sand to be a significant problem, it'd have to be leaching nutrients. In that case, replacing it might help. I don't think cleaning a shallow layer is going to do much. Siphoning out the bulk of the dinoflagellates will remove nutrients, but adding fresh saltwater could add enough trace elements to encourage a further bloom. Hello dear fellows, a small update from me: the dino population is further decreasing. Green algae are spreading on the tank glass. The dino jelly on the tank glass has transformed into a red cyano layer. Dinos are only visible at the water surface (I siphon them out) and on the anemone safety socks of the powerheads. I continue to feed large amounts of unwashed frozen food (three times than normal). Skimmer is on and skimming dry. Light cycle is normal: 12hours. I've never done a water cycle or a lights-out-for-three-days since the outbreak (end of october). All corals and anemones are open and looking great with one exception: the condylactis gigantea anemone, it has a white color and is further shrinking :/ (I've to say I never could establish this type of anemone in my tank, even before the outbreak, maybe it has something to do with toxins the RBTA is releasing into the water). All kinds of pods brittle stars and bristle worms are back in business, I've never seen such a huge population of algae feeding pods on the tank glass ^^ . Even the pest like caulerpa brachypus algae begin to spread out of the live rocks, if you ever encounter this type of caulerpa, remove it completely and fast as you can and watchout for small pieces drifting off! It has the ability to spread out even month after you removed it off the live rocks because of roots... I'll keep you up to date. 8 & 16 Gallon tanks. 16 Gallon tank: Dino. Ostreopsis outbreak since end of october 2015. Last edited by Kazalla; 12/07/2015 at 04:19 AM. I'd think you would have better luck soaking the sand in hydrogen peroxide after rinsing with RO water. The H2O2 should oxidize the organics still on the sand after rinsing. Rinse/soak/rinse again. If you choose to try it, let us know how it works out. Hi Billybatz9, I experience a Cyano outbreak just as my Dinos were going away. I panicked at first but in the end just let it run its course. I had what looked like Cyano and a green algae appearing as my Dinos left. Cyano is all gone, took about two weeks or so. now its green algae. And still no Dinos. Update from post #2303: I started my second dose of Dino X last night which is night #2. I got home at 6pm eastern standard time and see that over 75% of Dino is gone. I changed my lighting to run my whites, red, green for 4 hours and my blues for about 8 hours. My frag tank ran blues for 10 hours (plumbed together with 90 gallon). My Zoas/Palys are ALLLLLLLL fully opened!!!! They are brighter than the first time they've acclimated. I have a SPS dominated tank. No SPS suffered. I continued to use the turkey baster on the small areas. I here testimonies of 3-4 doses and reefers eliminated all of it. I'm going about 2 doses after I see 0% of Dinos. I will run my lighting the same way all week. Feeding once a day compared to 2-3 a day. Also dosing every 2 nights like recommended. I'm hoping by the 12th (my 5th dose) on Saturday I'll be done with this mess and start carbon and ramping my lighting back to normal. I figure I'll do nothing again. Beyond what I normally do that is. I'd say it's done for now. Probably see it again in another 5-10 years when I mess something up. I didn't touch it, siphon it, blow on it, or give it any kisses. Just left it alone and kept up with normal maintanence. Some detritus left but the pods will like that so I'll leave it for them. Update from post #2313: I'm using the same regiment. Great news!!! After dose number 3 I have less than dose #2. It's down to less than 25%!!! No ill effects!!! I'm still hoping by dose 5 every bit of Dino will be gone. My water looks so clear! Polyps on all corals are out. 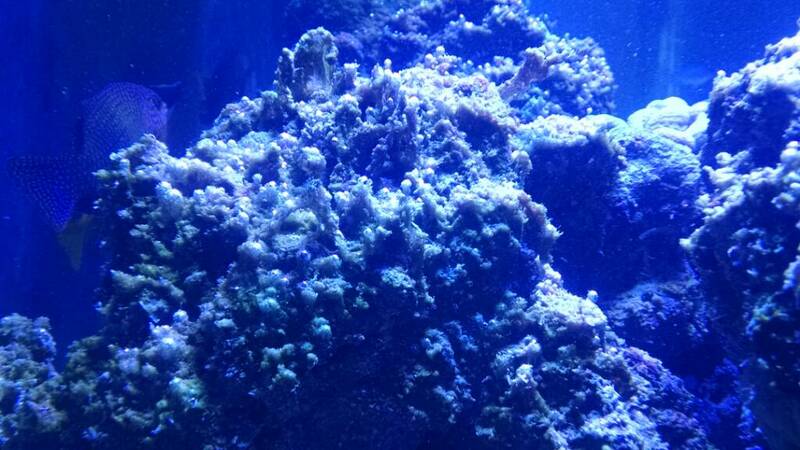 My coralline algae is showing. It was hidden behind and under the Dino. I kept hearing bad testimonies so I didn't grab the Dino X. I'm glad I did. To be cont. I know how you feel BillyBatz. Nothing more frustrating than this!! Thankfully as hoped my cyano has started to tail off. Right now I'm seeing a really cool green algae grow in my tank, not take over. Im assuming this green algae is helping keep the tank in balance? Unidentified dinoflagellates is this threads biggest problem. I've seen this green stuff on the image above punch a hole in my dino mat in a single day and then disappear the following day. I kept hearing bad testimonies so I didn't grab the Dino X. I'm glad I did. To be cont. Hope things work out for you. A friend of mine used DinoX and experienced similar results until 30 days after the last dose. The tank got ultra sterile and he lost all SPS corals to RTN and STN. He used 5 or 6 doses. 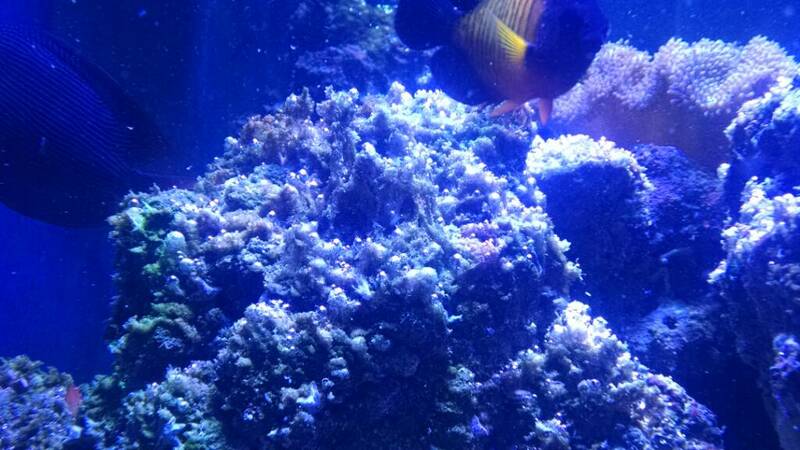 Dinos died along with coralline algae and SPS corals. Wow that's sad to hear. I will keep watch. Hey Billybatz9 my dinos are all but gone. A few strains on the plumbing into my tank. There might be some in my sump but its hard to say. Nothing on the rocks, glass or sand in my tank. Been this way for weeks now. Since I believe they will always be part of my reef system and keeping them in check is my goal...as I'm concerned I have them beat! Note: Billybatz9, back when I originally posted this picture you responded on 11/24 "My dinoflagellates algae looks just like yours". I meant to respond that I didn't think there were any Dinos in the picture, but rather just green algae and red cyano. But I could be wrong. Me too. It's come and gone in various sizes and shapes. I can't say I've seen it do anything to my Dinos b/c it appeared as they were pretty much gone. Love the color of it tho! Dirty method. So glad I went that way. 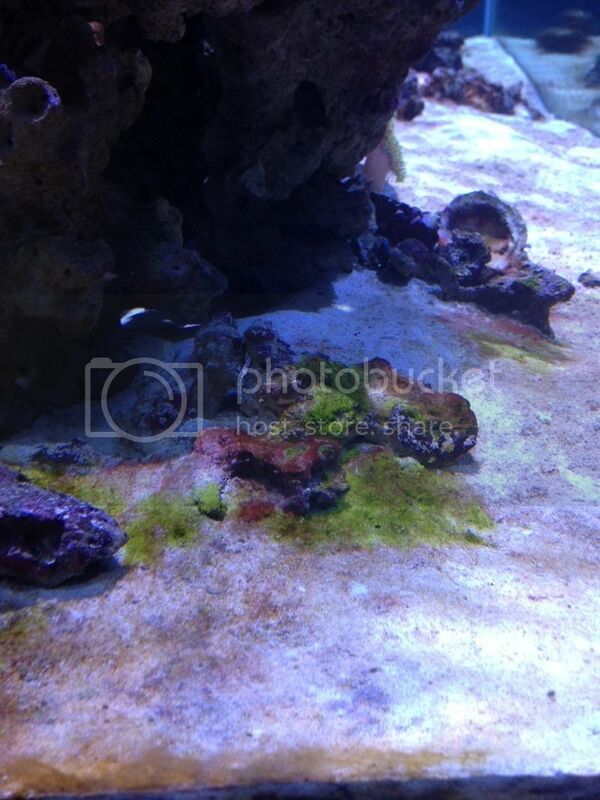 I think / hope everything in the pic is algae or cyano.